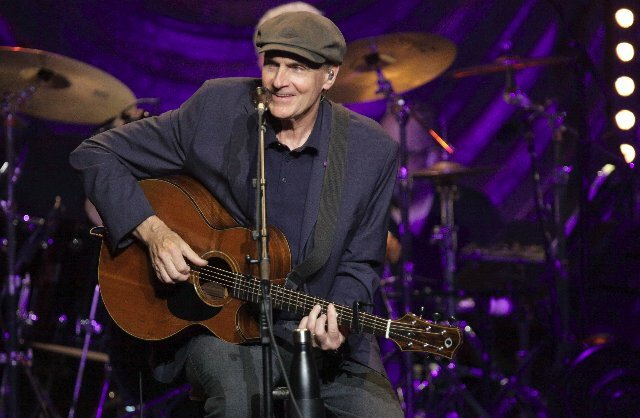 James Taylor photo by Hilary Scott. An intimate evening with Berkshire County’s own James Taylor and his All-Star Band proved to be hotter then the soaring temperatures in the Koussevitzky Music Shed. During the past thirty-five years of attending events at Tanglewood, last nights concert was warmer then any night concerts that I can recall. In classic James Taylor etiquette, his quirky comments and one line stories resonated well with the mixed age audience and kid friendly lawn. The house was packed on night two of his yearly visit. What was missing was a guest star, like Bonnie Raitt, who has been a member of this years tour, like last year. She recently had surgery and was not prepared to rejoin the tour. Also missing was James Taylor’s wife, Kim, and their teenage son, Henry, who so much wants to sing like his dad.. The All-Star Band has been traveling with Mr. Taylor for years. They are a tight-knit group of gifted musicians that include: Steve Gadd on drums, Walt Fowler on trumpet, bandleader Jimmy Johnson on bass, Andrea Zonn on violin and vocals, Kate Markowitz on vocals, Arnold McCuller on vocals, Kevin Hays on piano, Lou Marini on horns and Luiz Conte on percussion. JT has sold over 100 million records, is 70 years old and shows no sign of slowing down. On ‘I’m a Road Runner’, he grabbed a harmonica and played the blues before grabbing his six string guitar, kicking his leg in the air like Chuck Berry and dancing JT style on stage. He is still a young musician at heart who loves his audience. During the intermission, Mr. Taylor remained onstage and shook hands with audience members and volunteered to autograph everything that came his way, including a six string guitar. James Taylor is here to stay.